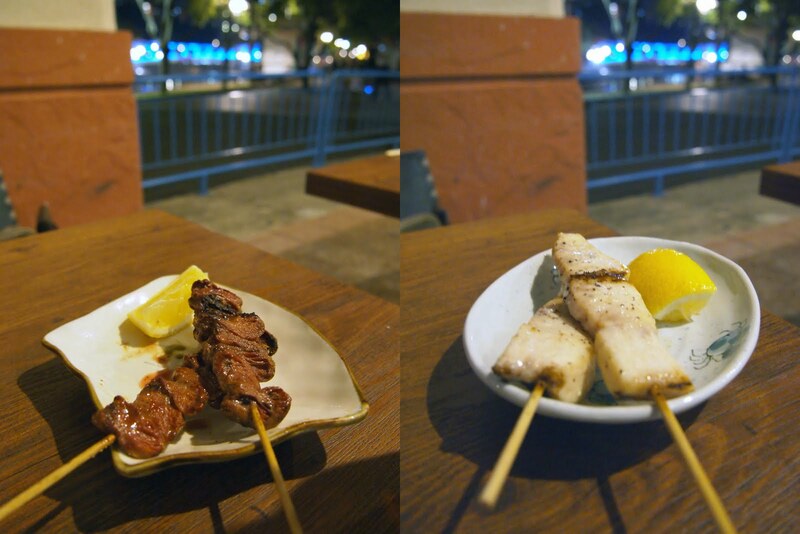 What better way to end a Friday evening than with Yakitori and beer - 日本人 style??!?! We headed down to Shunjuu Izakaya 春秋居酒屋 by Robertson Quay (definitely one of the nicer and pricey dining spots in town), but predicting a hefty bill we had our dinner at Kopitiam first! Sauntered in at 9pm and we started picking out our favourites from Japan days. I ordered the Gyu-Tan (beef tongue) which I've wanted to try when I was in Sendai the year before but didn't get the chance to. At $10 for 2 sticks, it was pretty pricey (and so were the rest of the food) - but was well worth for the ... inextricable texture. It's similar to a thin slice of shabu-shabu beef post shabu-shabu, but yet grilled and slightly chewy. And while technically not cow meat, tastes undeniably beef! While not quite a must try, it's definitely a try-at-least-once ones. 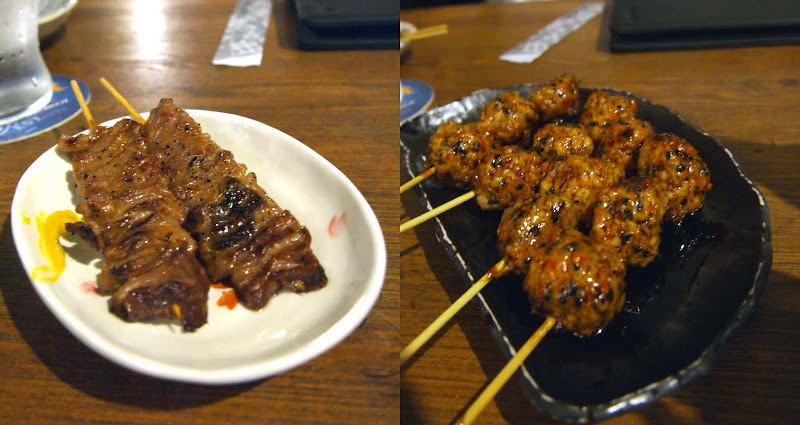 Then came the tsukune, which would possibly be one of the yummiest skewers you can get here at a reasonable price. Nice grilled aroma with your sticky sauce, very very flavourful and juicy to the bite, twas pretty awesome. Garlic pork and leek is one of my personal favourites, though I must say the ones here aren't the best I've had - the pork was a tad hard and not enough garlic flavour. Still pretty decent. Had the grilled swordfish - again probably a mistake on hindsight as swordfish for me is always best served raw. Swordfish when cooked somehow loses all the sweetness and the texture of swordfish sashimi is pure melon-like delight. The yaki version was just alright, and at $12 for 2 it was quite painful! We also tried the shiitake nikuzune ($6 for 2) - mushrooms stuffed with minced chicken were quite spectacular as well. And strangely, so was their pitan tofu o_O But all that, a drink each and a few scoops of ice creams and the bill came up to $136 for 3 people. Whoa ... $136? Considering we've already HAD dinner (which goes to show the amount of food we ate ... really wasn't that filling), $136 was a pretty strenuous price tag. I liken yakitori to shopping at Daiso - besides both being Japanese, $2 an item seems cheap at first but before you know it you've got 50 cups and saucers in your cart and shelling out $100. Japanese marketing at its best. In summary though Shunjuu Izakaya serves really authentic izakaya food as far as I can tell, and as per most izakayas - please do come after dinner!
" And there were numerous additional critiques, practically they all complementing the music piece and its writer. Currently, I have Mac hardware, and there are benefits to product synergy. When spending $200 dollars on anything, it gets hard to complain about the shortcomings.